Royals gathered at Christiansborg Palace in Denmark today to mark the 50th birthday of Crown Prince Frederik with a white-tie gala. You know what that means -- tiaras! 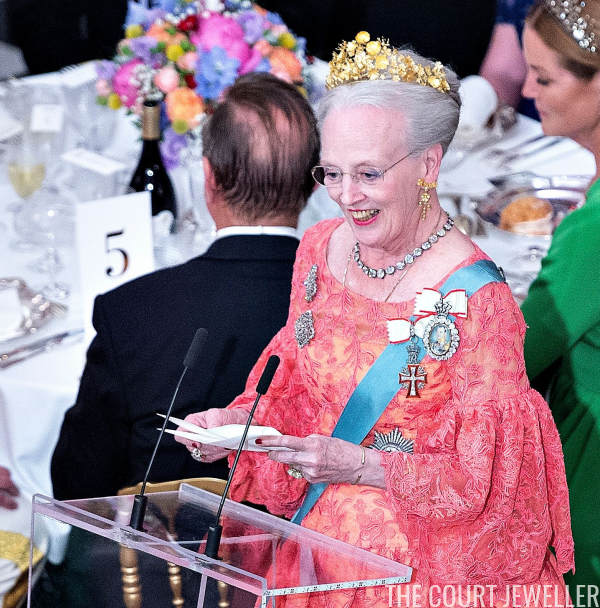 Queen Margrethe II paid tribute to her son while wearing her newest sparkler, the Naasut Tiara. She paired it with its matching earrings and a diamond riviere. 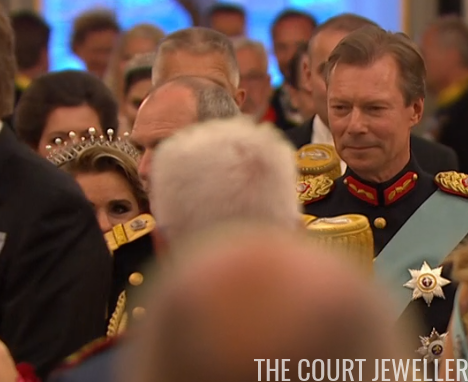 The pair of square diamond brooches she wears originally belonged to Queen Josefina of Sweden and Norway; they were originally used to secure the cloaks worn as part of traditional Swedish court dress. 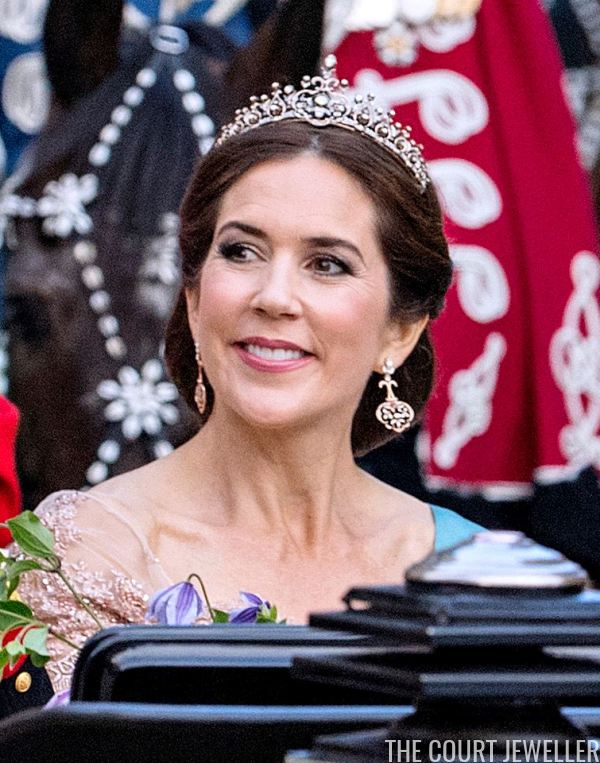 For her husband's big birthday celebrations, Crown Princess Mary also wore her newest sparkler: her Edwardian Tiara, a diamond, ruby, and spinel diadem that can also be removed from its frame and worn as a necklace. She wore the tiara with the earrings that she had made to coordinate with the piece. 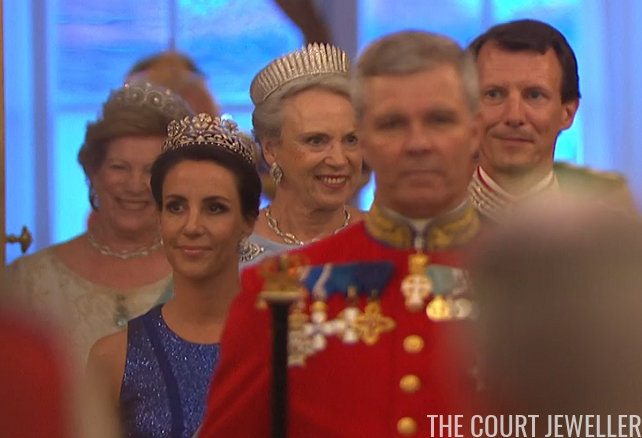 Princess Marie of Denmark didn't offer us any surprises with her tiara choice for the evening: she wore Princess Dagmar's Floral Tiara, which has been her go-to sparkler since her wedding day a decade ago. Countess Alexandra of Frederiksborg, was also on the guest list. 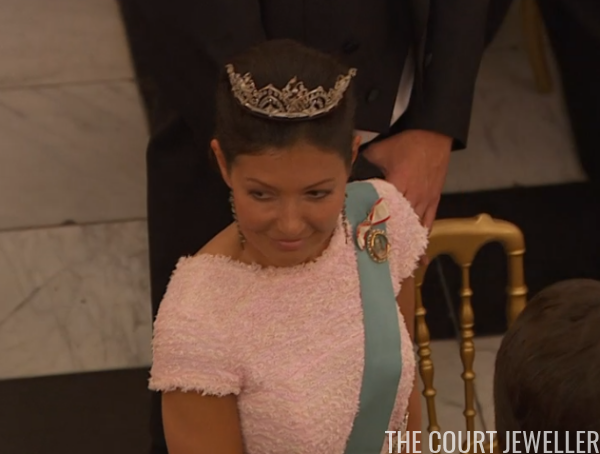 She wore the lovely Alexandrine Diamond Drop Tiara for the evening. 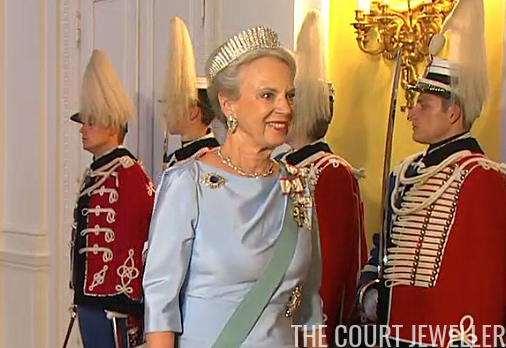 Princess Benedikte shone in the grand Sayn-Wittgenstein-Berleburg Fringe Tiara, a legacy from the family of her late husband, Prince Richard. 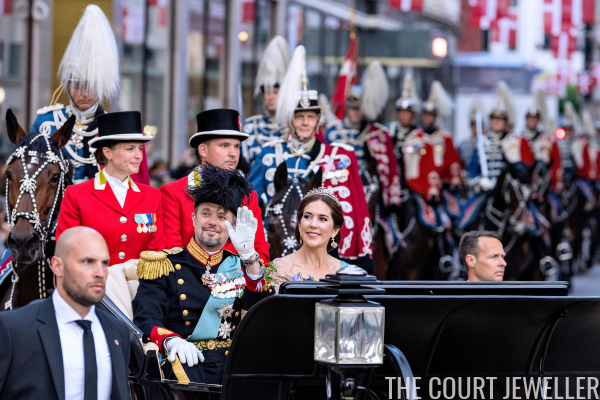 She paired it with the diamond fan earrings from her mother, the late Queen Ingrid, and the diamond necklace from the collection of her Danish grandmother, Queen Alexandrine. She pinned her diamond and sapphire brooch, which belonged to Princess Thyra, at her right shoulder. Benedikte's daughter, Alexandra of Sayn-Wittgenstein-Berleburg, was the other female member of the SWB family in attendance. She borrowed her mother's diamond floral tiara for the occasion; she also wore a pair of earrings set with pale blue gems. 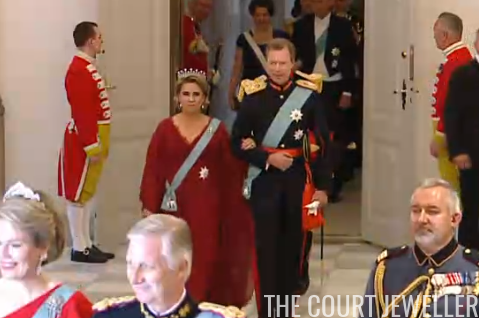 Queen Anne-Marie arrived for the gala dinner with King Constantine. She wore one of the family's most important tiaras: the Khedive of Egypt Tiara, which is the wedding tiara for Queen Ingrid's female descendants. She also wore her portion of the Queen Alexandrine necklace, plus the aquamarine heart pendant from the collection of Margaret of Connaught. 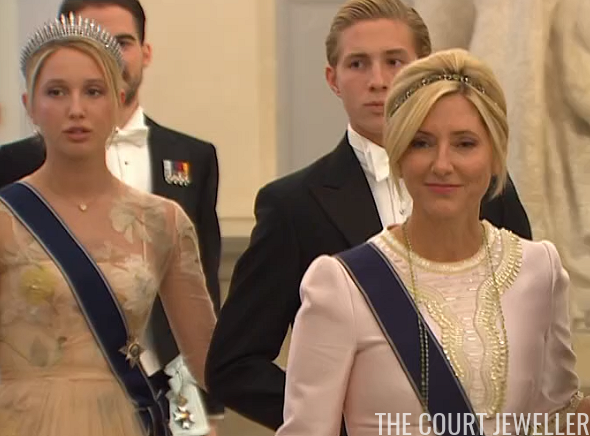 Anne-Marie's daughter-in-law, Marie-Chantal, disappointed just a bit with her tiara choice. She sank a diamond necklace or bracelet into her hair as a bandeau for the evening, and it was barely visible. She also wore two long necklaces. 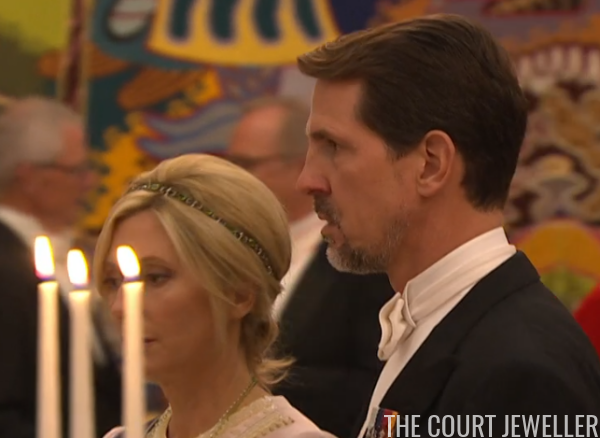 Here's another angle that shows Marie-Chantal's hair ornament, which appears to wrap most (if not all) of the way around her head. 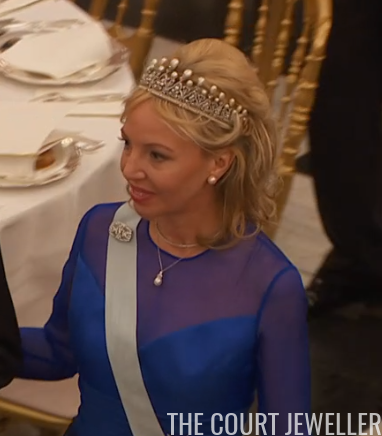 But Marie-Chantal's daughter, Maria Olympia, was one of the most exciting tiara wearers in attendance at the gala. 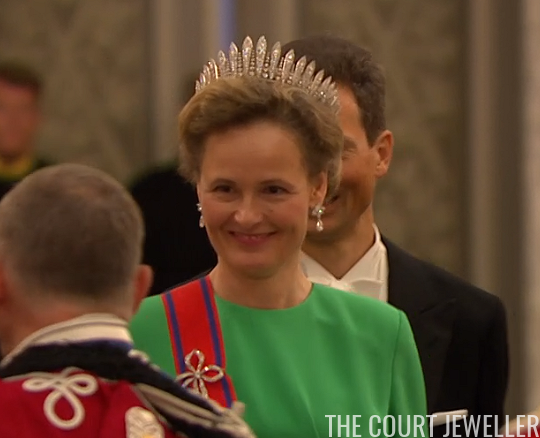 For the first time, she wore her very own sparkler: the Miller Fringe Tiara. This piece was a gift to baby Maria Olympia from her maternal grandmother on the day of her christening. During her childhood, it was often worn by her mother, Marie-Chantal. Now Olympia appears to have reclaimed it for her own jewelry box. 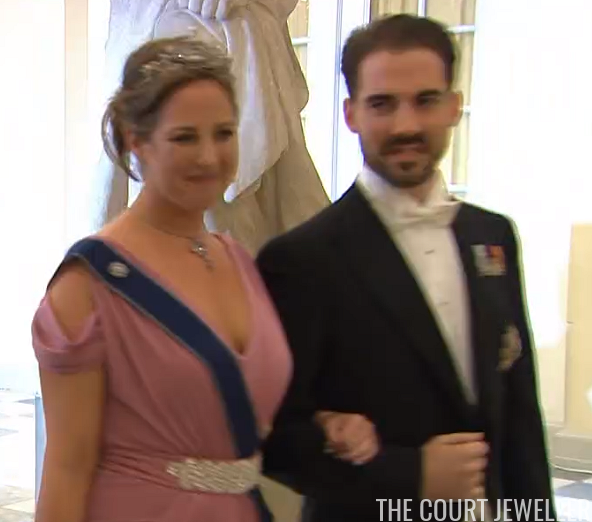 She's slightly blurry here, but Anne-Marie's younger daughter, Theodora of Greece and Denmark, borrowed her mother's Antique Corsage Tiara for the event. She paired it with a pendant necklace and a cluster button brooch. And one more heirloom Danish royal tiara was on display: Countess Sussie of Rosenborg wore Queen Alexandrine's Fringe Tiara for the occasion. Royals from other European houses were in attendance, too. 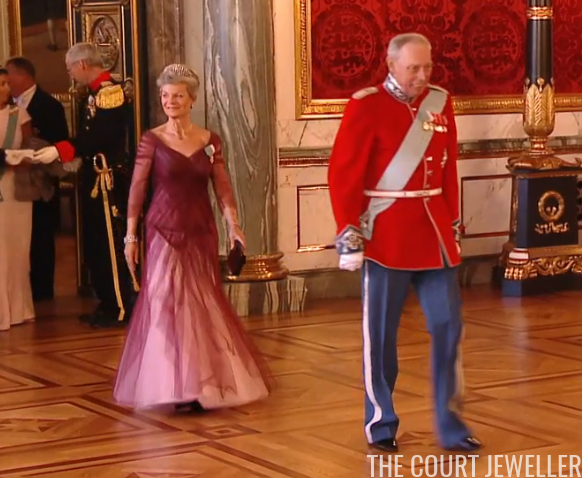 Queen Silvia of Sweden brought out a tiara we don't see very often: the King Edward VII Ruby Tiara. 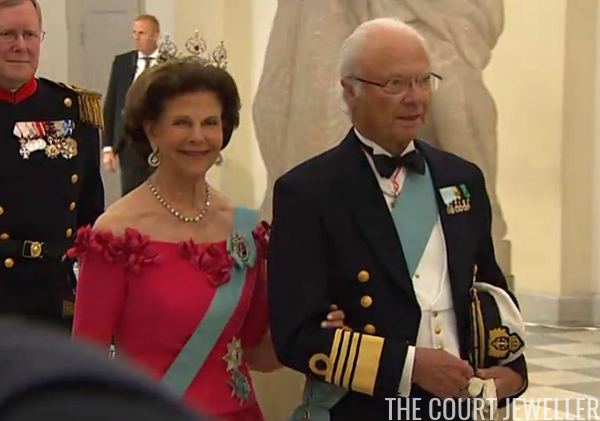 She also wore diamonds, including the Karl Johan Earrings. 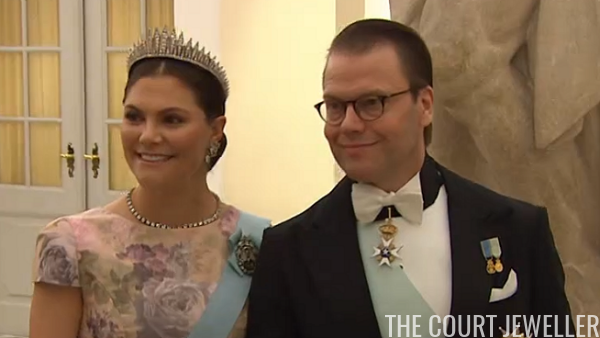 Crown Princess Victoria of Sweden wore a favorite sparkler, the Baden Fringe Tiara, pairing it with the diamond floral earrings from the Brazilian parure. 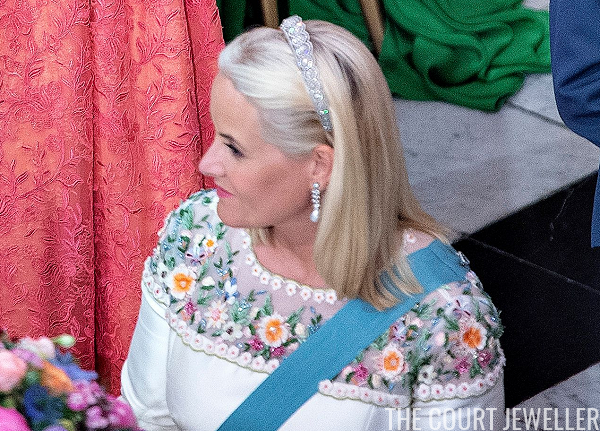 Crown Princess Mette-Marit of Norway wore her wedding tiara, the Diamond Daisy Bandeau, with her convertible diamond pendant earrings, worn on this occasion with pearl drops. 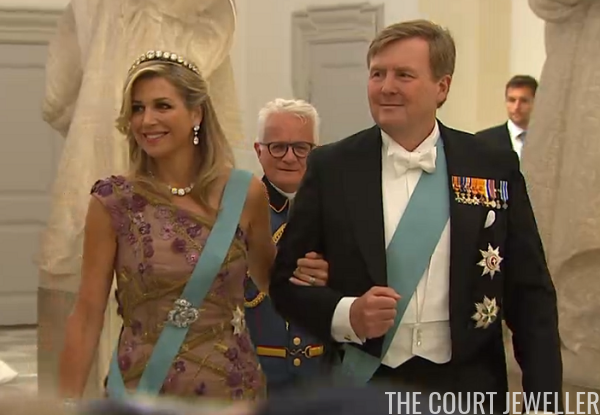 Fresh off the state visit to Luxembourg, Queen Maxima of the Netherlands wore a low-profile tiara with incredible wattage: the Dutch Diamond Bandeau. She paired the tiara with lots of additional diamonds, including one of the family's large diamond brooches, which she pinned at her waist. 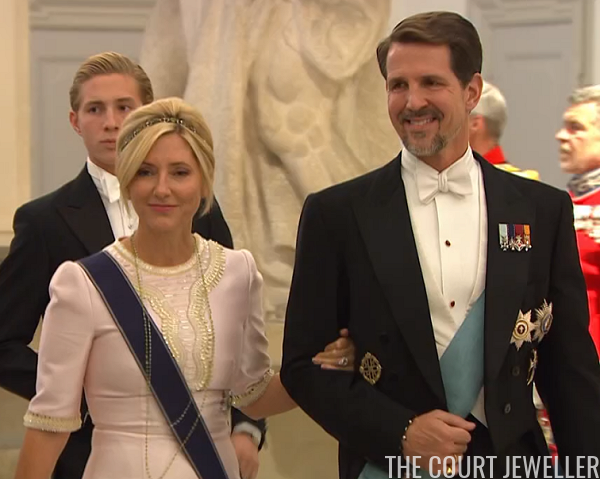 Grand Duchess Maria Teresa of Luxembourg wore the family's Chaumet Choker Tiara with its pearl toppers. 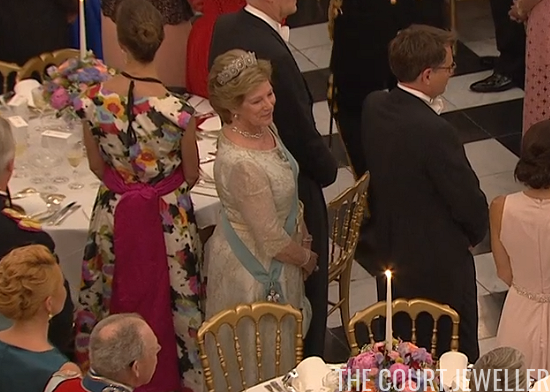 This is the second time we've seen the tiara this week; Hereditary Grand Duchess Stephanie wore it on Wednesday evening for the Dutch state banquet. You can just see the tiara, pearls and all, peeking over the crowd in this shot. 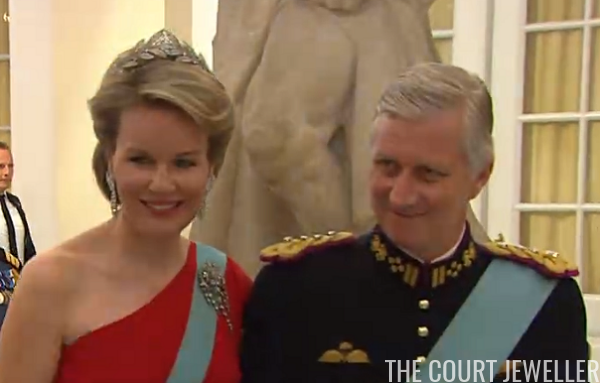 Queen Mathilde of the Belgians was lovely in diamonds, including the Brabant Laurel Wreath Tiara, her diamond fringe earrings, and Queen Fabiola's Diamond Fringe Brooch. 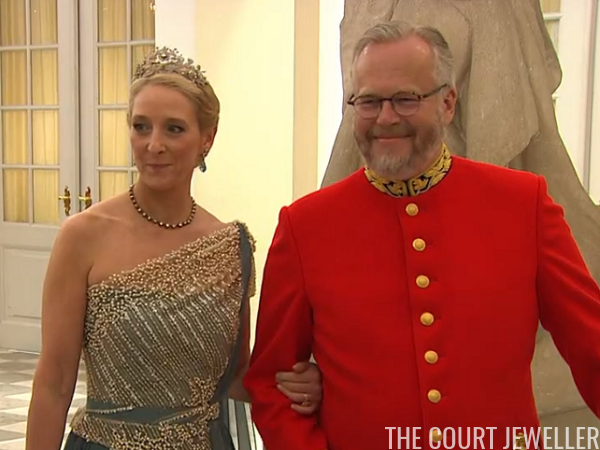 Hereditary Princess Sophie of Liechtenstein doesn't usually attend Danish royal events, so it was wonderful to see her at this gala. She donned the Habsburg Fringe Tiara and a lovely diamond ribbon brooch for the occasion. And we also caught a glimpse of the magnificent Ancona Tiara on Camilla of Bourbon-Two Sicilies. She and her husband are good friends of the Danish crown princely couple; he's even one of Princess Josephine's godparents. It was a festival of fringes tonight, with examples from Denmark, Germany, Sweden, Greece, and Liechtenstein on show. Which jewels from tonight were your favorites?